TVR Cerbera Speed Six. Finished in Antigua Blue with Portland Grey Interior. This is a two owner car with 13 Stamps in the service book, all done by TVR Central, Castle TVR, Topcats, Austec and lastly by Mole Valley. The car has a very comprehensive file with a lot of history and will be fully serviced to TVR Heritage standards prior to sale. OUR CARS UNDERGO A RIGOROUS PRE-DELIVERY INSPECTION & ARE SUPPLIED WITH 3 MONTHS COMPREHENSIVE WARRANTY! This advert is for a TVR Cerbera, click TVR Cerbera in Dorking to see more cars like this in the local area. Want to search further afield? 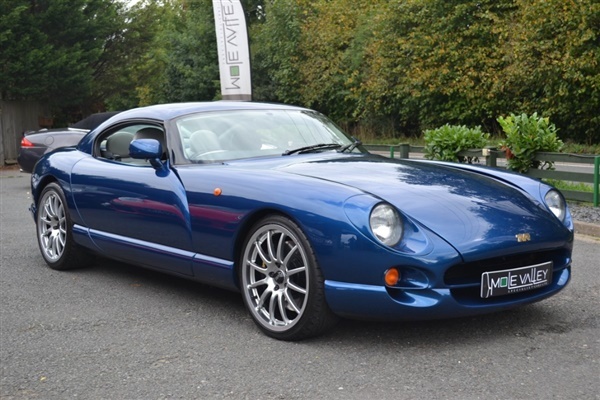 Click TVR Cerbera in Surrey to search for similar cars in the wider Surrey area.